If you love multi-factor authentication like I do–ok, I don’t love it, we don’t know each other well enough for me to call it love just yet…it’s still a new relationship, ok? Don’t pressure me! Multi-factor authentication is not a Security silver bullet. It’s just a way to add another layer to the “security onion”, making an authentication breach a little more difficult for attackers and making that vector a little less desirable. If you read about the RSA SecurID breach not so long ago, you know that even the most respected vendors can take a tumble. So, this article is not about who has the best product or how to make your network impenetrable–it’s about providing another layer to your remote access security, using Cisco ASA and AnyConnect, along with a Microsoft CA server you may already have running in your environment. And as usual, I’ll focus on the Cisco configuration, rather than the Microsoft server config, since I don’t manage that device. If you followed the Wikipedia link above about multi-factor authentication, you saw that there are basically three factors available for authentication: something you know (like a password), something you have (like a certificate or token), and something you are (like a biometric scan to determine that you’re you). With standard VPN authentication, we tend to only choose one of those items–passwords. Unfortunately, people-being-who-we-are tend to choose weak passwords that are easy for us to remember and that are, therefore, easy to guess or find. Taking the ease out of password cracking/guessing is what RSA or other authentication tokens were made for: forcing some authentication complexity on the end user who’s not necessarily concerned about security, in a way that’s easy for them to repeat. The problem with these sorts of tokens is that they can be very expensive to deploy. 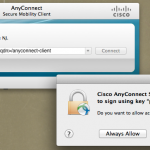 Cisco has made it pretty easy to deploy two-factor authentication in two different modes: on-box and off-box. In the on-box mode, the ASA is a certificate authority and manages the certificates used for two-factor authentication itself. There’s no additional cost to this method, but it just doesn’t scale well. The off-box method is what I’ll describe here, but as I alluded to earlier, we won’t be using RSA tokens, we’ll use PKI, implemented with a Microsoft CA server infrastructure. Please keep in mind there are definitely best practices for creating a PKI infrastructure of your own and it’s something you should be very diligent about. A compromised CA will affect a lot more than your remote access. 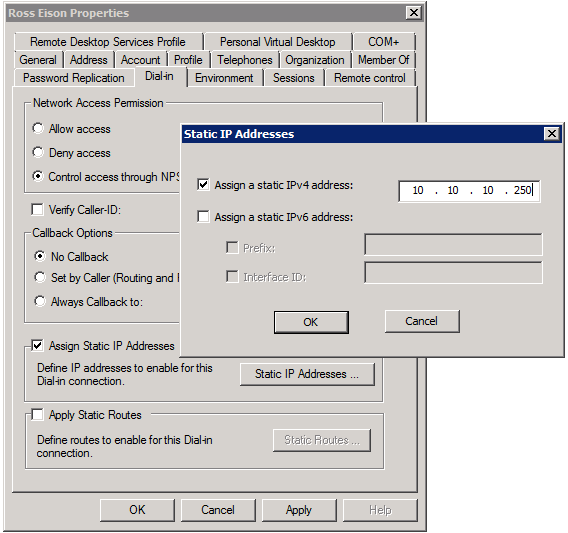 You have a working Microsoft CA/PKI infrastructure set up and secured. You have a working Cisco ASA, ready to be configured for remote access using AnyConnect clients.
! change default group-policy to "no access"
On my Mac, I now get prompted to approve the use of the client certificate stored in my keychain whenever I try to connect to our ASA. Of course, I can choose to make the selection permanently, but I’d rather continue to see that two-factor authentication is required for this group-policy.